My name is Chris Theodorakis and I have been resurfacing baths for over 28 years. This extensive experience allows me to give you an honest opinion as to how we can best meet your needs. Please call me now for an obligation free quote. Ultraglaze turned my old bath into one that looks brand new! 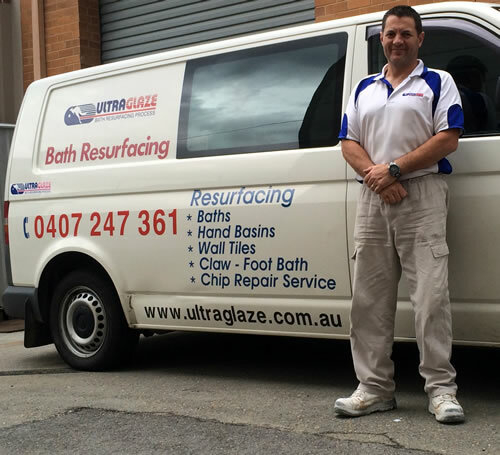 I had to organise someone to resurface my Mum’s old bath so I called Ultraglaze in because they seemed very friendly and professional. They did the job faster than any other tradesmen I’ve ever used and gave Mum a fantastic finished product. 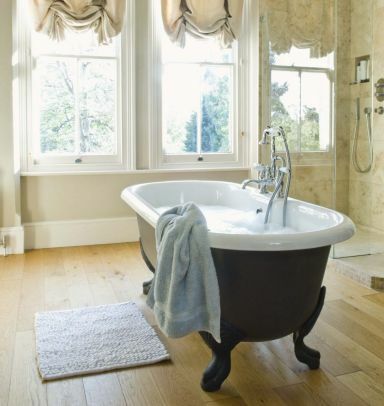 The guys had a great attitude to their work and did a quality job on the bath resurfacing. Mum is really thrilled with it and says her old bath looks brand new! (She got to use it the next morning too). There were no problems, the pricing was great and I’d recommend Ultraglaze to anyone who is looking for a professional job. This involves cleaning the existing surface with our Ultraglaze Pre-Cleaners. We use a two-stage approach, which will leave the surface perfectly clean and free of contamination. Our Pre-Cleaners are designed to cover the pH spectrum, allowing us to achieve the desired result. Any chips or deep scratches are rebuilt with high quality metallic grade filler. In nearly all cases there should be no evidence of damage to the original surface. The area around the item being resurfaced is carefully masked. This not only allows us to control over spray, but it also helps to minimise the amount of air borne dust from landing on the item during application. The Ultraglaze Primer is a unique bonding agent, which is applied to the item prior to resurfacing. Without the Primer the job would simply fail. This “adhesion promoter” is a critical element in the Process, and is applied following catalyzation. The Ultraglaze Coating is now applied to the item with the aid of a HVLP Turbine powered gun. This equipment is specially designed and set up for the application of low viscosity coatings. The Operator will apply several layers in succession until the desired thickness is reached. There is no limit to the choice of colour, however white is by far the most commonly used colour for sanitary ware. The newly applied surface is now cured via the use of a High Frequency Infrared baking Unit. This simply speeds up the curing time from overnight to as little as a few hours. This allows us to finish the work in a timely manor. Now that the surface is cured, we can proceed to another of the steps that is unique to Ultraglaze. The freshly resurfaced bath, basin, shower tray can now be hand rubbed to remove any dust particles that landed on the item during step 5. This unique step contributes to our ability to offer the highest quality results in our Industry. Now that you bath looks brand new again, the only thing lacking may be the original waste outlet fitting. With age, the original fitting may be tarnished, missing the chrome plating, or just worn out. Your Ultraglaze Technician can fit a chrome or gold plated waste outlet insert, without the need to remove the original fitting. Once installed, the original fitting will not be visible, only the shiny new waste to compliment the new looking bath! Please see photos of this in our gallery. We endeavour to respond to messages received through the contact form within 1-2 working days.